As the continued run-up to the 2019 North American Handmade Bike Show that will be held in Sacramento, CA on March 15-17, we’re spotlighting some of the bike brands that will be found in the aisles. For this installment we kept things local with a spotlight on Squid Bikes who frame shop is located within shouting distance of the Sacto convention center where the show will be held. Pro racer Emily Kocharek is a co-founder of the brand and she acted as our host for the interview. RBA: Squid started when and by who? Emily: Squid came into existence gradually, launching officially in September of 2014. Our four founders, Chris Namba, Peter Knudsen, Marty Woy and myself had spent the previous few years working to build the local Sacramento cyclocross community in ways that felt welcoming and fun focused, with the goal of getting more people on cyclocross bikes. We hosted free cyclocross “pick-up” races, built and lent out cobbled together cyclocross rigs, and eventually managed my program as a first year UCI cyclocross athlete. We all had varied but deep roots in the sport which included professional road racing, working as a bike messenger, managing a professional road team, and bike retail experience. Collectively we had a whole lot of half baked ideas about what the bike industry could look like if we did things our way. My first year on the UCI cyclocross circuit I went to the hobby store and covered one of my frames in what I liked to call “80s neon throw-up” vinyl so that it would better match my neon kit. I couldn’t go anywhere on that bike without turning heads. That jaw-dropping reaction to the bike was the catalyst for founding an actual LLC. 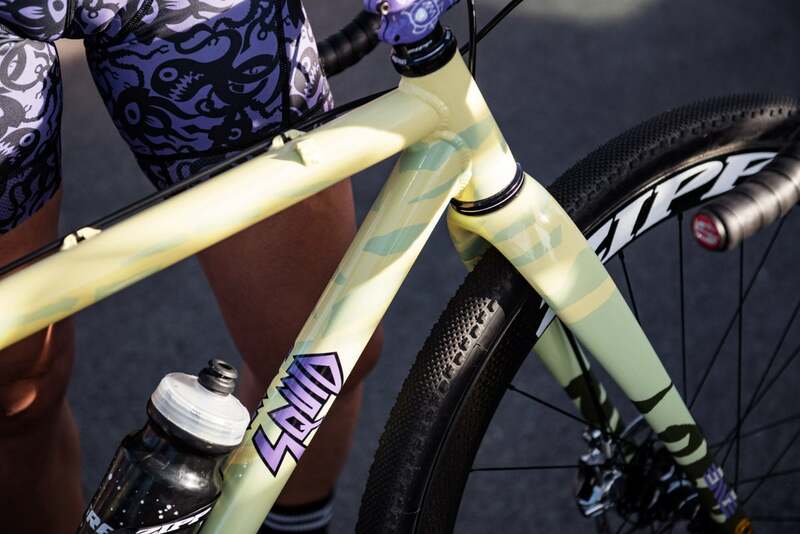 Squid Bikes was the platform for us to carry out some of our wild ideas, creative vision and general love of experiencing the world on two wheels. We didn’t start the company with a clear purpose or goal, or even an expectation of success. We just knew we were doing what we loved and it seemed to be connecting with people. RBA: What is your racing experience? Emily: I began both riding and racing bikes while working on a bachelor’s degree at UC Davis. I competed in a number of Collegiate National Road Championships, and have two Collegiate Road National Titles. After college I quit racing and didn’t ride much until I began bike commuting to classes at Sacramento State University. While working on my Masters Degree I re-started the Sacramento State Collegiate Cycling Team and began competing in local road events. After completing my Degree I was offered a professional road contract and raced a full NRC schedule for 3 years. During that time I did two European racing blocks with the US National Team that included both longer stages races as well as a few of the Spring Classics. Racing Tour of Flanders was a highlight of my road career. For a number of reasons I decided to quit road racing and start racing cyclocross in 2013. In 2014 we started Squid Bikes. The Squid World Tour allowed me to race UCI cyclocross across the US as well as in Australia, China, Japan, and Canada. I recently did my last professional UCI cyclocross race while racing in Japan. I am proud to finish my racing career having been able to compete in both road and cyclocross World Cups as well as stand on the top step of both NRC and UCI podiums. RBA: What was the goal in starting a bike brand? Emily: Starting the bike brand was more about the experience, an experiment of sorts, and less goal oriented. The brand served as sort of a cover for hanging out in the back yard spray painting bikes with our friends, for designing logo free cycling kits that we actually wanted to wear, for supporting unconventional athletes we wanted to see shredding at the races, for unashamedly bringing some color, creativity and art to cycling aesthetics, and for generally promoting the idea that riding bikes is supposed to be fun! RBA: best learnings since it all started – have ideas about what consumers want changed? Emily: Rather than trying to follow consumer whims or the latest industry trends we have learned that grounding ourselves in authenticity is the best path forward. We thought our old bikes were boring, so we painted them. We wanted quality handmade products that we could feel good about, so we had our frames welded by someone 10 min down the road who has been doing making bikes since 1988 and had a friend sew chamois into some cut off Dickies. We wanted to ride along the river with our friends, sometimes fast, sometime slow. We wanted to skid around corners, stop for a swim and grab a beer at the corner store. Easy. We are just trying to carve out our little slice of bike heaven, and if it connects with people, great. If not, well that’s fine too. RBA: Cyclists should consider Squid if they are looking for…. Emily: A ripping handmade machine for a fair price that they can finish anyway they see fit. We’ll provide the raw metal canvas, inspiration, paint and tips. From there it’s choose your own adventure. Paint your own bike, maintain your own trails, grow your community and pass it on.